"Happy birthday" A.C.E. Dong Hun’s Birthday Support has been Opened in Korea, China and Japan. 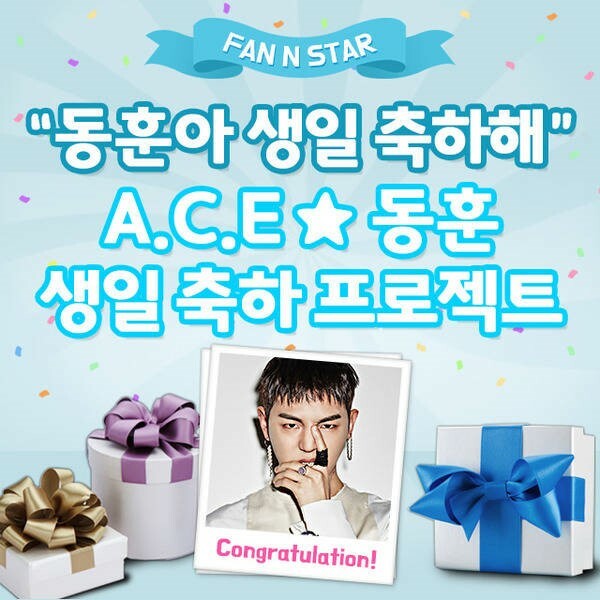 [The Fact] FAN N STAR held a birthday event for Dong Hun the member of A.C.E. On Monday, "FAN N STAR opened a support for Dong Hun's birthday. It is a large project where birthday advertisements are posted in different places according to the number of stars (points) that gather in a project. Fans from South Korea, China, and Japan can participate in Dong Hun's birthday event. A congratulatory message written by fans will be Shown into the advertisements, it adds special meaning for them. If the star reaches100, the video of Dong Hun's birthday will be displayed on the electronic display board of 43 subway stations on Seoul Subway Line 2. If it reaches 400,000 stars, there will be a video screening of the subway and an advertisement for a travel bus. When 600,000 stars are reached, a congratulatory commercial video will also be released on the CGV screen in Apgujeong. Attention is focusing on whether the project, which celebrates Dong Hun's special day, will succeed for the rest of the event. Anyone can apply for an idol anniversary event hosted by "FAN N STAR" More information about the event can be found in the website.